1. U.S. Census Bureau, 2015 American Community Survey 1-year estimates, Tables B19113B-I, C17010B-I. 2. Assets and Opportunity Nebraska State Data, 2016. Our children, communities, and state are stronger when all of Nebraska’s families are able to participate fully in the workforce and establish financial security. Achieving economic stability occurs when parents have the education, skills, and opportunity to access work that pays a living wage. In turn, parents who are economically stable can provide their children housing, child care, health care, food, and transportation. Public assistance provides a vital safety net for families who are unable to provide these necessities on their own. Well-structured public assistance programs gradually reduce assistance while supporting families moving toward financial independence. 1. U.S. Census 2015 American Community Survey 1-year estimates, Table B17006. 2. U.S. Census 2015 American Community Survey 1-year estimates, Table B10059. In the United States, there is an ongoing relationship between race and ethnicity and poverty, with people of color experiencing higher rates of poverty. Poverty rates in Nebraska also continue to reveal significant disparities based on race and ethnicity. These disparities grew out of a history of systemic barriers to opportunity for people of color that still have a presence in our society and institutions today. We need to continue working to address these barriers in order to ensure that all children have the best opportunity to succeed. Source: U.S. Census Bureau, American Community Survey 1- year estimates, Tables B17001, B17010. Source: U.S. Census Bureau, 2014 American Community Survey 5-year estimates, Tables B17001B-I. Nebraskans pride themselves on being hard-working people. In 2015, 77.9% of children in our state had all available parents in the workforce.1 Unfortunately, having high labor-force participation doesn’t always translate into family economic stability. The chart at right illustrates the gap between low-wage earnings and the amount needed to provide for a two-parent family with two children. It assumes that both parents work full-time (40 hours a week), year round (52 weeks per year). That means no vacation, no sick time, just work. Minimum wage in Nebraska is $9.00 an hour.2* If both parents work at minimum wage, their monthly income will be $3,142. This puts them above the federal poverty level of $2,025. The federal poverty level doesn’t describe what it takes for working families to make ends meet. For that we turn to the Family Economic Self-Sufficiency Standard (FESS). The FESS uses average costs, like fair median rent or the average price of a basic menu of food, to calculate what a family needs to earn to meet its basic needs without any form of private or public assistance. It does not include luxuries like dining out or saving for the future. For a two-parent, two-child family of any age, the FESS for Nebraska is $3,142 a month.3 That requires an hourly wage of $9.06 per parent. 1. U.S. Census Bureau, 2015 American Community Survey, Table B23008. 2. United States Department of Labor, “Minimum Wage Laws in the States – January 1, 2015,” www.dol.gov. 3. FESS was calculated using an average of 2010 figures for a two-adult, two-child family, adjusted for 2015 inflation. Data used to calculate information is courtesy of Nebraska Appleseed Center for Law in the Public Interest. For more information, please see the Family Bottom Line Report: www.voicesforchildren.com/familybottomline. *Minimum wage increased to $9.00/hour starting January 1, 2016. Source: Georgetown University Health Policy Institute: Center for Children and Families. *For families with more than 8 people, add $4,160 for each additional member. Source: Financial Services, Operations, Nebraska Department of Health and Human Services (DHHS). Is Nebraska’s safety net catching families in need? The chart below explores whether ADC adequately reaches children and families in need. The number of children in poverty and extreme poverty over time is compared with the number of children receiving ADC. The gaps between extreme poverty and ADC enrollment suggest that Nebraska’s safety net has not kept pace with growing needs. The Aid to Dependent Children program received additional funding with the adoption of LB 607 in 2015. LB 607 sought to address a problem with the ADC program, in which the payments did not adequately cover the cost of living: in 2013, the average monthly payment was only $326.17. The enacted bill raises the monthly payment level to 55% of the standard of need, an average increase of $72 per month to help approximately 6,200 Nebraska families with low incomes. It also provides financial assistance to families transitioning off of ADC to help them get back on their feet. 1. Financial Services, Operations, Nebraska Department of Health and Human Services (DHHS). 2. U.S. Census Bureau, American Community Survey 1-year estimates, Table B17024. The Nebraska Homeless Assistance Program (NHAP) serves individuals who are homeless or near homeless. Not all homeless people receive services. individuals at risk of homelessness. children ages 18 and under at risk of homelessness. Source: Nebraska Homeless Assistance Project, 2015 CAPER Report. 7,367 public housing units with 7,061 occupied. 12,792 vouchers with 11,609 in use. 4,785 units were 1 bedroom (non-family). Homeownership provides a sense of stability for children and communities. 1. U.S. Census Bureau, American Community Survey 1-year estimates, Table B25115. 2. Nebraska Office of Public Housing, HUD. 3. Annie E. Casey Foundation, Kids Count Data Center. 4. Ibid. Families with high housing cost burdens spend more than 30% of their pre-tax income on housing. 5. U.S. Census Bureau, 2015 American Community Survey 1-year estimates, Table B25003B-I. With poverty rates remaining high in recent years, it is not surprising that many families with children struggle to put food on the table. Approximately 111,888 households in Nebraska were food insecure in 2015—meaning they didn’t know where their next meal was coming from at some point during the last year. 1. National and State Program Data, Food Research & Action Center, USDA, Household Food Security in the United States in 2015. 2. Feeding American, Map the Meal Gap 2016. The Supplemental Nutrition Assistance Program (SNAP) is one of the most effective anti-poverty programs in the United States. It provides nutrition assistance to low-income individuals and families through benefits that can be used to purchase food at grocery stores, farmers markets, and other places where groceries are sold. In Nebraska in 2014, SNAP moved 8,300 households above the poverty line. Characteristics of the Supplemental Nutrition Assistance Program Households: Fiscal Year 2014, USDA, Food Nutrition Services, The Office of Policy Support. Sources: Financial Services, Operations, Nebraska Department of Health and Human Services (DHHS). U.S. Census Bureau, Population Estimates Program, 2015 Annual Estimates of the Population, Table PEPASR6H. were put under their mother’s custody. were put under their father’s custody. were put under both parent’s custody. were given a different arrangement. Source: Vital Statistics, Nebraska Department of Health and Human Services (DHHS). children living with grandparents, extended family, or close friends without the involvement of the child welfare system. children were living in kinship care in 2014-16.
were living with a grandparent who was their primary caregiver in 2015. Source: Kids Count Data Center. Custodial parents who do not receive child support payments they are owed by non-custodial parents may seek assistance from the Department of Health and Human Services. Assistance is provided by Child Support Enforcement (CSE). 180,443 cases received CSE assistance, this is 71.4% of child support cases in Nebraska. $218,163,424 of child support collected through CSE. $217,341,153 of child support disbursed through CSE. 19,002 cases received services through CSE, but payments were not being made. 1,672 cases received public benefits who are eligible for child support, but it was not being paid. 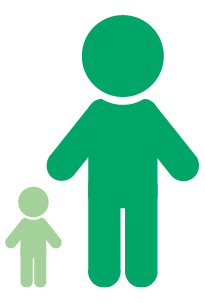 ** If the custodial parent is receiving ADC, the state is entitled to collect child support from the non-custodial parent as reimbursement. Source: U.S. Census Bureau, 2015 American Community Survey 1-year averages, Table B23008. Source: Bureau of Labor Statistics, Alternative Measures of Labor Underutilization for States, Annual Averages, U-3, U-6. Source: U.S. Census Bureau, 2015 American Community Survey 1-year estimates, Table B19126. 1. Bureau of Labor Statistics, Characteristics of Minimum wage workers, 2015. Source: U.S. Census Bureau, 2015 American Community Survey 1-year estimates, Table B19113B-I. These households do not have sufficient net worth to subsist at the poverty level for 3 months and 1 month, respectively, in the absence of income. 133,688 families claimed $314,901,957 in federal Earned Income Tax Credit (EITC). 132,598 families claimed $30,955,482 in state Earned Income Tax Credit. 152,553 families claimed $207,159,661 in federal Child Tax Credit. 53,950 families claimed $28,354,908 in federal Child and Dependent Care Credit. 57,294 families claimed $11,909,837 in state Child and Dependent Care Credit. 96,180 families claimed $134,806,425 in Additional Child Tax Credit. 5.4% of households had no vehicle available in 2015. Source: U.S. Census Bureau, 2015 American Community Survey 1-year estimates, Table B08201. Source: ITEP, Who Pays? A distributional analysis of the tax systems, Nebraska, 2015. Source: U.S. Census Bureau, 2015 American Community Survey 1-year estimates, Table S0802.